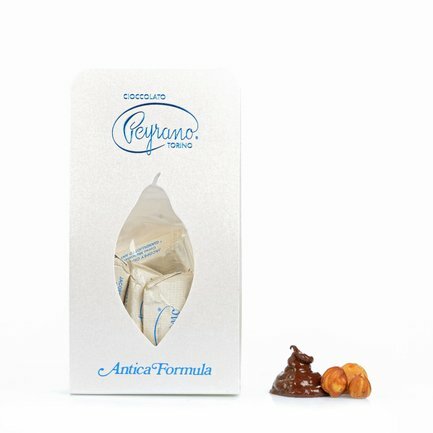 Antica Formula Giandujotti are Peyrano's superb interpretation of this most traditional Piedmont chocolate confection. Made in accordance with the historic recipe which contains no milk but only sugar, cocoa, Bourbon vanilla pods and 28% of Piedmont IGP hazelnuts. Soft and pervasive on the palate, these giandujotti confections are delicate and with enticing natural sweetness. The ideal accompaniment to your favour blend of coffee, these delicious chocolates are also exquisite when savoured on their own. Ingredients sugar, Piedmont hazelnuts IGP 28%, cocoa, Bourbon vanilla pods. May contain traces of milk and milk-based products, nuts and lecithin (soya). For more information on product labels, please contact our Customer Service department. The information on the labels of the products may vary for reasons beyond our control, therefore, there may be discrepancies between the information on the site and that on the products delivered. Please always check the information on the product before consumption or use.